The People section includes lists - with brief biographical descriptions - of the famous and infamous characters of Tamriel, as well as full articles when there is enough information to warrant it. Who qualifies for the Lore? Only people from officially approved TES media who are noteworthy from a Lore perspective qualify to be in this section - that is, people who have played important parts in noteworthy historical events and who have had substantial effects on the world of TES. If in doubt that an individual qualifies, it is best to have a talk page discussion and reach a consensus. 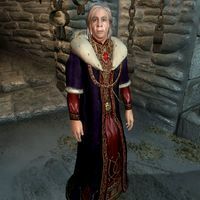 People who are only noteworthy to fans (such as Morrowind:Fargoth or Skyrim:M'aiq the Liar) are typically not mentioned because they are relatively unimportant figures in the Elder Scrolls universe. People who are not well-known by the populace in the games, but who are still historically significant, may be included, such as Lore:Lucien Lachance. In some cases, it may be appropriate to include an entry for a persona, not an actual person, such as Lore:The Gray Fox. Certain persons or personas who are largely unknown but important may be included, such as Lore:Shezarrine or Lore:Night Mother, but it's wise to have a discussion first. Authors of books are excluded from the People section unless they have some historical significance independent of their works. For example, Lore:Mannimarco and Lore:Vivec are authors whose historical significance goes well beyond their writings, while Praxis Sarcorum or Carlovac Townway are not noteworthy beyond authoring famous books. Exceptions are possible in the best judgment of the community. For a list of authors, see here. This page was last modified on 11 May 2018, at 21:48.